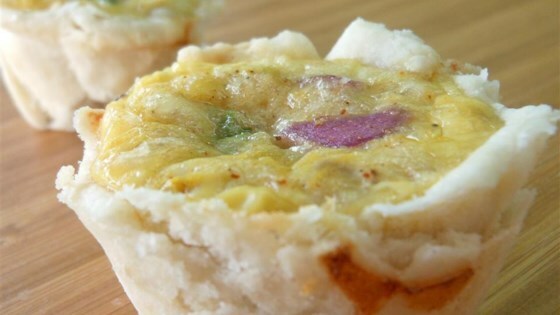 "These tasty mini-quiches are easy to make and sure to impress! This can be served with sour cream and diced tomato on top." Preheat oven to 350 degrees F (175 degrees C). Grease 24 mini-muffin cups. Beat cream cheese and butter until well combined. Add flour; mix until a dough forms. Divide dough into 24 balls and refrigerate. Whisk eggs and milk together in a bowl. Stir Monterey Jack cheese, chorizo sausage, green chiles, red onion, cilantro, garlic powder, black pepper, ground cumin, cayenne pepper, and salt into the egg mixture. Place one dough ball into each prepared muffin cup; press dough gently into the base and sides to form a dough cup. Spoon egg mixture to fill each dough cup. Bake in preheated oven until center of quiche is set, 25 minutes. Mini quiches with big Mexican flavor! :-) Make sure you're using mini-muffin cups rather than regular sized ones to make sure there is enough dough for the recipe! These are totally awesome! Instead of making 24 minis I used a 12 muffin pan and they worked great! Update: made 300 mini quiches for midnight lunch for my daughters wedding . All quiches eaten within 1/2 hour of being served. Other food served as well. Quiches were a super big hit!